(Nanowerk News) Collaboration between researchers at the U.S. Department of Energy's National Renewable Energy Laboratory (NREL), the Swiss Center for Electronics and Microtechnology (CSEM), and the École Polytechnique Fédérale de Lausanne (EPFL) shows the high potential of silicon-based multijunction solar cells. The research groups created tandem solar cells with record efficiencies of converting sunlight into electricity under 1-sun illumination. The resulting paper appears in the new issue of Nature Energy ("Raising the One-Sun Conversion Efficiency of III-V/Si Solar Cells to 32.8% for Two Junctions and 35.9% for Three Junctions"). Solar cells made solely from materials in Groups III and V of the Periodic Table have shown high efficiencies, but are more expensive. Stephanie Essig, a former NREL post-doctoral researcher now working at EPFL in Switzerland, is lead author of the newly published research that details the steps taken to improve the efficiency of the multijunction cell. While at NREL, Essig co-authored a paper, which was published in the IEEE Journal of Photovoltaics a year ago ("Realization of GaInP/Si Dual-Junction Solar Cells with 29.8% 1-Sun Efficiency"). "This achievement is significant because it shows, for the first time, that silicon-based tandem cells can provide efficiencies competing with more expensive multijunction cells consisting entirely of III-V materials," Tamboli said. "It opens the door to develop entirely new multijunction solar cell materials and architectures." 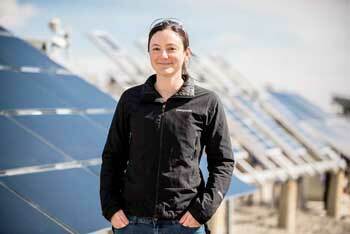 NREL scientist Adele Tamboli, co-author of a recent article on silicon-based multijunction solar cells, stands in front of an array of solar panels. In testing silicon-based multijunction solar cells, the researchers found that the highest dual-junction efficiency (32.8%) came from a tandem cell that stacked a layer of gallium arsenide (GaAs) developed by NREL atop a film of crystalline silicon developed by CSEM. An efficiency of 32.5% was achieved using a gallium indium phosphide (GaInP) top cell, which is a similar structure to the previous record efficiency of 29.8% announced in January 2016. A third cell, consisting of a GaInP/GaAs tandem cell stacked on a silicon bottom cell, reached a triple-junction efficiency of 35.9%--just 2% below the overall triple-junction record. The existing photovoltaics market is dominated by modules made of single-junction silicon solar cells, with efficiencies between 17% and 24%. The researchers noted in the report that making the transition from a silicon single-junction cell to a silicon-based dual-junction solar cell will enable manufacturers to push efficiencies past 30% while still benefiting from their expertise in making silicon solar cells. The obstacle to the adoption of these multijunction silicon-based solar cells, at least in the near term, is the cost. Assuming 30% efficiency, the researchers estimated the GaInP-based cell would cost $4.85 per watt and the GaAs-based cell would cost $7.15 per watt. But as manufacturing ramps up and the efficiencies of these types of cells climbs to 35%, the researchers predict the cost per watt could fall to 66 cents for a GaInP-based cell and to 85 cents for the GaAs-based cell. The scientists noted that such a precipitous price drop is not unprecedented; for instance, the cost of Chinese-made photovoltaic modules fell from $4.50 per watt in 2006 to $1 per watt in 2011. The cost of a solar module in the United States accounts for 20% to 40% of the price of a photovoltaic system. Increasing cell efficiency to 35%, the researchers estimated, could reduce the system cost by as much as 45 cents per watt for commercial installations. However, if the costs of a III-V cell cannot be reduced to the levels of the researchers' long-term scenario, then the use of cheaper, high-efficiency materials for the top cell will be needed to make them cost-competitive in general power markets.